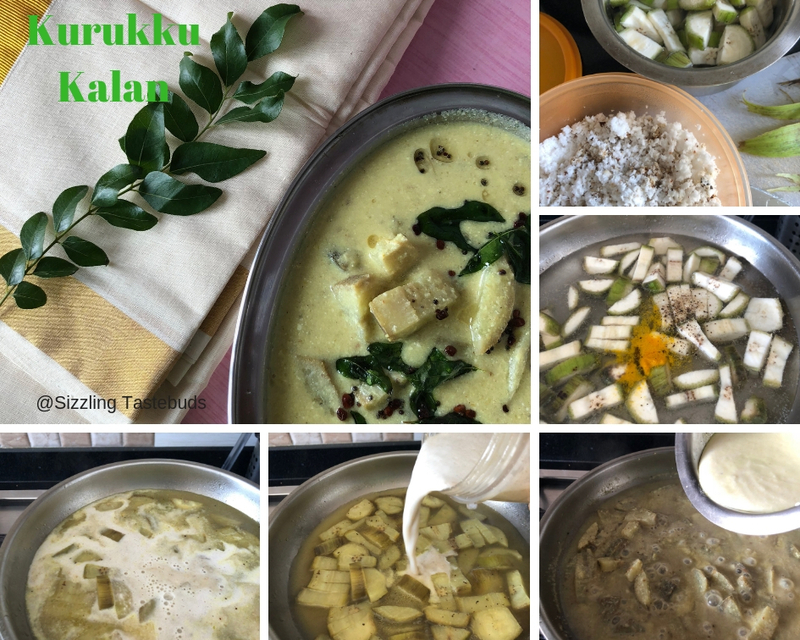 Kurukku Kalan is a delicious curry made in everyday Kerala homes and especially for Onam Sadhya (festive) meal. Although we make this somewhat similar, I wanted to follow an authentic recipe, which my Keralite friend directed me to her mom's recipe. This curry was very well received by all at home, and keeps for 3-4 days in the refrigerator. and the flavours deepen as they sit. 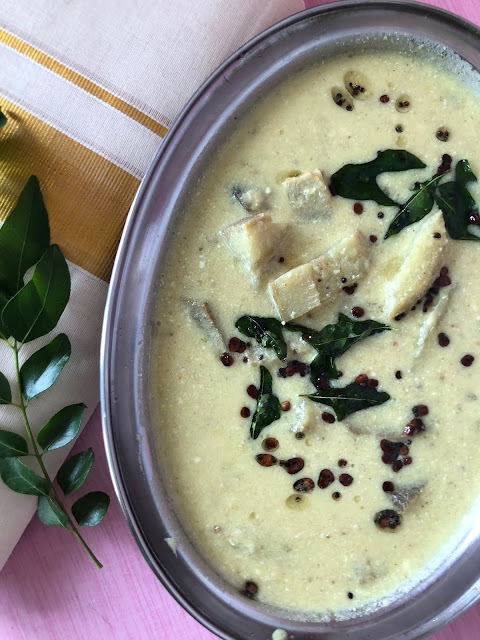 Serve it with hot rice , kerala papad and ghee for a scrumptious meal. 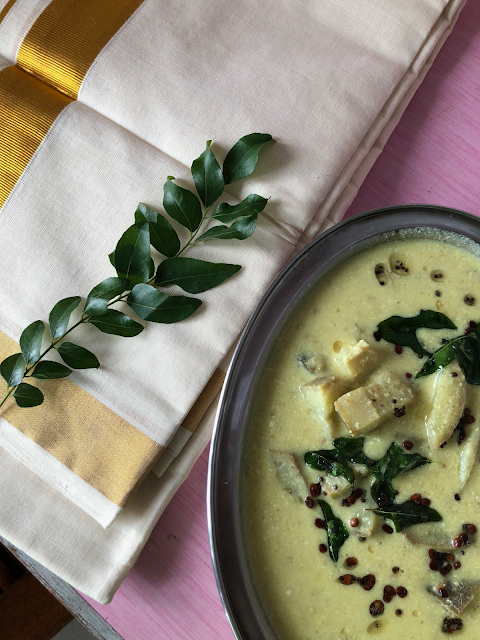 This can be made with with either yam or raw banana and as I was given Raw banana and Coconut by Shobha Keshwani who was my partner for this month's Sshh Secret Cooking challenge, it was a great way to eat raw banana (my husband's favourite) in a delicious curry. Be it yam or raw banana, apparently 3-4 ingredients are vital to a good Kalan (as we discovered) : turmeric, pepper powder, fresh curd and fenugreek powder. Do try this and let me know how you liked it. Peel Raw banana and cut into largish cubes. Reserve in salted,turmeric water with the pepper powder for 10 mins. Bring to a boil with the spiced water and add fresh pepper powder, cook till raw banana is done, but not mushy . keep aside. Grind all ingredients under "to grind" to a smooth paste. Whisk this paste in the thick yoghurt. Add this yoghurt-masala mixture to the cooked veggies (along with the water). adjust salt , and add fenugreek powder and let it simmer on a low flame to a thickish consistency. 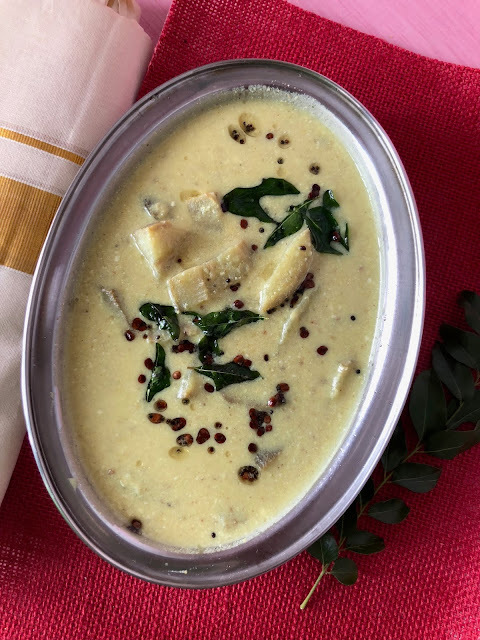 There are so many gravies in the sadya that can be made in advance and kept, and this one is surely one of them... looks so yum! Very easy to make and looks some what like avial. I always make Kalan for Onam and love this with some thoran, steamed rice and unlimited papadams. Needs so little ingredients, yet one of the best. Looks so yummy n so simple to make. Lovely one kalyani. Kaalan can be made with a combination of raw banana and yam and they taste real good. Yours look so delicious too. Just love kurukku kalan anytime, never get bored of this dish. Inviting me. You made simple raw banana gorgeous. Curry sounds superbly delicious. Bookmaking it. This looks so inviting and yum. Have not used raw bananas much except for chips, but this looks a must try. 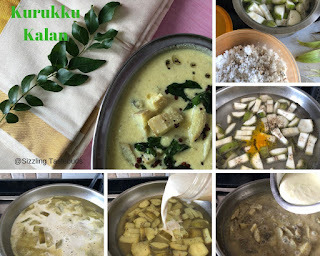 Super delicious Kalyani, I had made this curry for another group challenge and hubby and I loved it. Easy to make and so tasty. Also a bit was leftover and you're right it tasted so much better the next day. Mellow yet delicious Kalan. I so agree with you that it tastes better the next day; in fact, this is true of so many Indian dishes. This looks so delicious, love raw banana, but never tried this way. Goes well with hot steamed rice. Wow, love the step by step recipe pics here. the finished one looks lipsmacking. Have tried making avial and just loved it's flavors. I am sure this raw Banana curry in yogurt taste great as well as the recipe sounds similar. Yummilicious share !